"Chaya Bhuvaneswar's debut collection maps with great assurance the intricate outer reaches of the human heart. What a bold, smart, exciting new voice, well worth listening to; what an elegant story collection to read and savor." "Stunning, evocative, electric...an exuberant collection." A woman grieves a miscarriage, haunted by the Buddha's birth. An artist with schizophrenia tries to survive hatred and indifference in small-town India by turning to the beauty of sculpture and dance. Orphans in India get pulled into a strange "rescue" mission aimed at stripping their mysterious powers. A brief but intense affair between two women culminates in regret and betrayal. A boy seeks memories of his sister in the legend of a woman who weds death. And fragments of history, from child brickmakers to slaves in Renaissance Portugal, are held up in brief fictions, burnished, made dazzling and unforgettable. In seventeen remarkable stories, Chaya Bhuvaneswar spotlights diverse women of color--cunning, bold, and resolute--facing sexual harassment and racial violence, and occasionally inflicting that violence on each other. Winner of the 2017 Dzanc Short Story Collection Prize, White Dancing Elephants marks the emergence of a new and original voice in fiction and explores feminist, queer, religious, and immigrant stories with precision, drama, and compassion. Chaya Bhuvaneswar is a physician and writer with work in Narrative Magazine, Tin House, Electric Lit, The Millions, Joyland, Michigan Quarterly Review and elsewhere. Her poetry and prose juxtapose Hindu epics, other myths and histories, and the survival of sexual harassment and racialized sexual violence by diverse women of color. She has received a MacDowell Colony fellowship, Sewanee Writers Conference scholarship and Henfield award for her writing. Follow her on Twitter at @chayab77 including for upcoming readings and events. "Bhuvaneswar’s debut story collection, already eliciting praise from the likes of Lauren Groff and Jeff VanderMeer, explores urgent themes of sexual harassment and racial violence through a poetic lens, exploring a cast of marginalized characters and infusing them with bracing life." “Chaya Bhuvaneswar proves to be an evocative new voice in feminist fiction…The stories are really brilliant. They’re breathtaking in a way that forces me to pause between each one and just sit with the endings for a bit." "[A] pleasingly devious streak, at times reminiscent of Patricia Highsmith, winds through the collection, offsetting the latent melodrama. Shocking late twists and disclosures furnish a sense of unpredictability ... [A] compulsively readable debut." "How free is anyone, driven as we are by impulses deeper than thought, moving through inextricably connected societies? This debut author has created a host of original scenarios through which to probe this vital question—a question that’s both a long-running conversation between East and West and one of the intractable problems of the human condition." 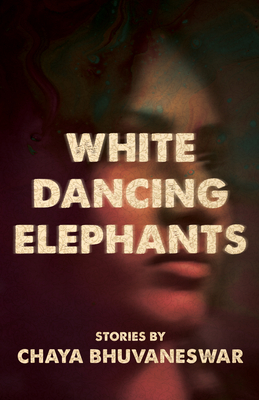 "Chaya Bhuvaneswar is a *force* in her provocative debut short story collection White Dancing Elephants. These stories center on women of color who resist easy categorization — a therapist who is drawn to but disgusted by her young patient, a scholar desperate to justify her affair with her terminally ill best friend's husband, a woman remembering the girlfriend she abandoned when she accepted her arranged marriage. Bhuvaneswar fully inhabits them, breathing life into their dissonant, beautiful, complete selves. Reading it is a thrill, sure to leave you breathless." "Chaya Bhuvaneswar's debut collection maps with great assurance the intricate outer reaches of the human heart. What a bold, smart, exciting new voice, well worth listening to; what an elegant story collection to read and savor…"
"In this evocative debut short-story collection, Bhuvaneswar pulls readers deep into the psyches of women who are vulnerable and lost, dangerous and clever: a woman clinging to denial over her miscarriage, an artist with schizophrenia, two women in a doomed love affair." "Consider Bhuvaneswar one of the most original feminist voices in literature—you need to add this short story collection to your cart stat." "Bhuvaneswar’s compelling stories portray diverse characters grappling with shifts in their lives, the complications of their actions, and the impacts of others...a striking collection." "Bhuvaneswar tackles the intricate interactions of race, class, and sexuality in this enticing debut... The political charge of each relationship is reinforced by Bhuvaneswar’s articulation of the simmering drama created by them...The collection is sharp and provocative, and Bhuvaneswar’s voice rings true." "The 17 stories in this debut collection take place around the world, exploring queer and interracial love, extramarital affairs, and grief over the disappearances of loved ones. The book provocatively probes the aftermath—the aftermath of death, of grim diagnoses, of abandonment, of monumental errors in judgment. Passages jump back and forth in time to dissect how the consequences of a fraught event shape and unravel the lives of innocent casualties....An exuberant collection." "A magnificent collection of stories that defy conventions, stereotypes, and reveal the universal complexity we all share as humans—gifted and flawed individuals, who struggle to reconcile the mixed signals of our own hearts."